Edinburgh head coach Alan Solomons says it would be a "wonderful, wonderful achievement" for his side to win the European Challenge Cup. Gloucester are Edinburgh's last obstacle in their pursuit of the trophy, with the final at Twickenham Stoop on Friday evening. "To win a competition of this nature would be incredible," said Solomons. "The big thing is for us to deliver a performance, possibly our best performance of the year." Mid-table in the Pro12 and still in pursuit of the top-six place that would give them a Champions Cup place next season, Edinburgh could become the first Scottish club to win a European trophy. 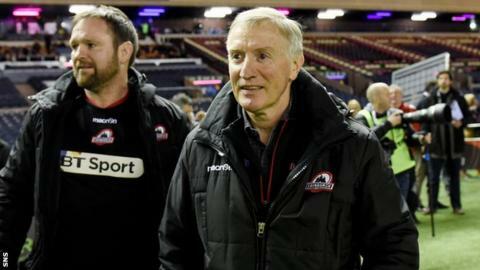 "Everyone's looking forward to the game, everyone's excited about it," Solomons told BBC Scotland. "It's a big occasion. "It would be absolutely fantastic for us to pull it off. "We have to be at our absolute best to do it. We're up against a strong side but we have a good team, there is a good team spirit and everyone's determined to see this through." Solomons has made two changes to his side with full-back Greig Tonks returning, along with number eight Cornell Du Preez. The latter's serious leg injury had threatened to rule him out for the rest of the season and Solomons praised medical staff and the player for his rapid return to action. After winning Pool 5, Edinburgh overcame London Irish and Newport Gwent Dragons to reach the final. "We've had some incredible challenges this season, which we've risen to on each occasion," said Solomons. "It would be fantastic for Edinburgh Rugby. Obviously, it would be fantastic for Scottish rugby and all our supporters." The South African is out of contract in the summer but played down the suggestion any new deal was dependent on Edinburgh's end-of-season fixtures. "No, I don't think that's the case at all," he said. "I think these things just sometimes take time and I have no doubt it will be resolved fairly shortly."